The unique, patent-pending Ultra 182 sit-stand workstation provides 180° of smooth vertical and horizontal rotation and enables full articulation of monitor and keyboard. 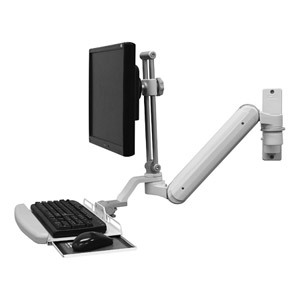 This arm adjusts 24″ (61 cm) vertically, adapting quickly and easily to any user’s height. The arm rotates 180° at the wall mount for unsurpassed reach in all directions. Solid construction supports up to 32 lbs (14.5 kg). Available with our standard keyboard tray or our Keyboard Ultra Slide. Stows 10” (25.4 cm) from the wall making it the perfect choice for tight spaces. The Ultra 182 sit-stand workstation is modular and customizable to suit the user’s needs.